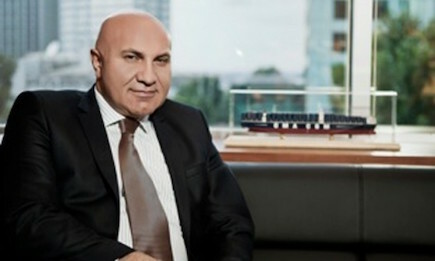 Yildirim Holding AS, a Turkish ports and mine operator, plans to expand in the U.S. port industry and boost investments in Kazakh mines. The Istanbul-based company, closely held by the Yildirim family, is seeking to benefit from a slump in asset prices as the plunge in commodities hurts valuations, Robert Yuksel Yildirim, chairman and chief executive officer, said in a phone interview on Friday. The company plans to spend about $5 billion on acquisitions and invest a further $5 billion in building power plants in Turkey by 2025, he said. Port operator unit Yilport Holding AS bought Tertir-Terminais de Portugal for $308 million in September, boosting the number of ports it operates to 18. The business has total cargo capacity of 10 million TEUs and aims to become one of the top 10 port operators in the world by 2025, he said. The group is also seeking additional chromium mine assets in Kazakhstan, where it owns the Voskhod chrome plant that it bought from OAO Mechel. Among potential targets in the U.S. are Ports America Holdings Inc., an operator owned by Oaktree Capital Group LLC’s Highstar Capital LP, and some ports in Latin America including Ecuador, he said. “We want to help open up U.S. ports to world business if we buy assets there,” Yildirim said. “There are some attractive port assets in the Americas.” The company is in talks with pension funds from Canada and the U.S. for possible partnership in buying out ports in the U.S., he said. Yildirim Holding is also reviving plans to raise between $500 million and $1 billion from the sale of a 20 percent to 30 percent stake in the port operator unit, based on an expected valuation of about $3 billion for the company, Yildirim said. JPMorgan Chase & Co. will advise the company on the plans, he said. The sale may be completed in six months, he said. Yilport, which had earnings before interest, tax, depreciation and amortization, or Ebitda, of $165 million in 2015, will have roadshows in London and Amsterdam this week and next, and non-binding bids will be collected from potential suitors in May, Yildirim said. Yildirim Holding, which gets 60 percent of its revenue from international operations, will probably post total sales of $1.4 billion to $1.5 billion this year, little changed from last year, Yildirim said, adding net income then was about $300 million. About 35 percent of the group’s sales come from metals and mining, while the ports business make up 27 percent of revenue, he said. The remainder is from fertilizer and energy operations.